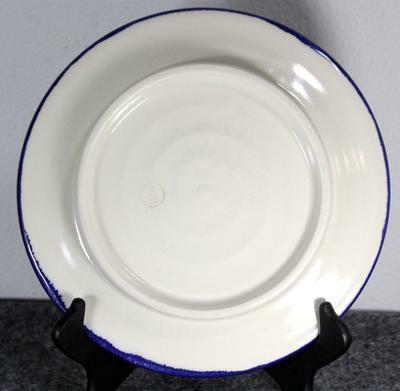 For the last couple of years I have been reselling dinnerware and such on eBay. While searching for inventory one day, I came across these plates and bowls at a thrift store in Boca Raton. They are signed William Bell and have an impressed bell on the base. 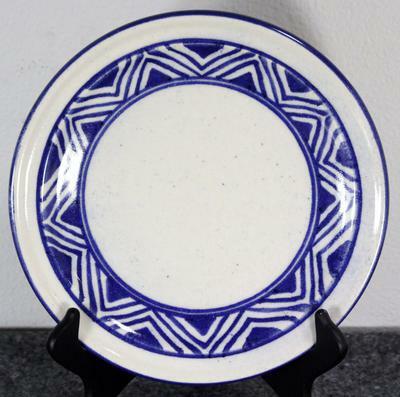 They have a blue geometric, retro, starburst design on white pottery. There are specks of blue on the face of the wares but none on the back, suggesting this was done as part of the design. There is a swirl on pieces suggesting these were thrown on a wheel. I am becoming more interested in older stoneware but being in South Florida it is hard to find older pieces as you would up north. I have found a few pottery and potter's art pieces that are hard to part with because they are so appealing. Most impressive, in my opinion, are the Italian pieces. My exposure to potters art is limited but would like to see more of it in my collection. I have searched the web with numerous different queries in search engines and can't seem to find the mark on these pieces. 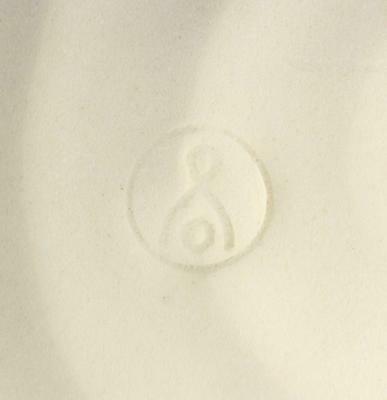 It may be a small local shop somewhere, but I can't seem to find another mark like it. I have checked with Bell Potters in Canada and Maine and am waiting for a reply from the Museum of Ceramics in Zaneszille, Ohio. Since I am a novice, I have no clue as to the age of these pieces. Not sure if these are remnants, I doubt it, of Bell Brothers. I read an article stating they had found a few shards of stoneware while excavating the old factory site, as their main product was porcelain before closing. Interested to get anyone else's ideas on this. Nice post, interesting obscure pottery, thanks. Hand painted, a bit shakily, and impressed mark. All indicative of a local guy either amateur or small scale rather than manufacturer. I did a hunt around for this name William Bell. Both surname and first name are fairly common, so you would expect a bit of action within the ceramics world. I could only find two examples of the name William Bell in the history of china/ceramics manufacturing. There is nothing to link your item with either men, so the mystery goes on, I'm afraid. Any clues would be gratefully received, let's hunt this down like we have done so many times before. The first William Bell I could find is US based. three East Liverpool men, William M. and Edward F. Bell and Henry W.Flentke . It began production in July 1889. The wares were marked BBColCHINA and later BPColF 0 or an impressed "Bell Pottery Co."
William Bell was president of the company and died in situ in 1902. The company produced beautiful hand-painted ware and high-quality in dinnerware and toiletware until 1904. The second William Bell was English, from Hull, Yorkshire and is associated with a company called the Belle Vue Pottery which was founded in 1802, went into larger scale production in 1826 and lasted until 1841. The Belle Vue Pottery was founded by a William Bell who named the works after a nearby street called Belle Vue Terrace. It was presumably a play on his name too. 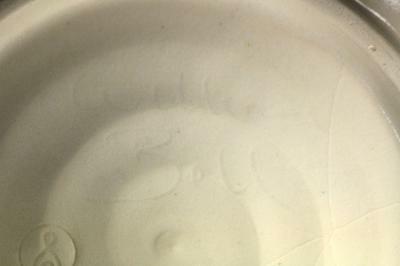 Most of the pots were made from high quality white earthenware. Many had no pottery mark. But there have been several mark variations recorded - a single bell with the name BELLE VUE, a double bell with the same words, the bell motifs with no words, and sometimes just the name with no bell motifs. Most of the Belle Vue wares had patterns which were both hand painted and transfer printed. Floral designs were often hand painted and other styles of pot had slip decoration applied by hand and others had brightly coloured glazes. Pieces were often hand modelled and press moulded with the end result that the decoration becomes part of the structure of the item, rather than applied afterwards. Don't forget to mention which thread they are for in your email as I may well forget. Thanks. William and Vicky Bell were local pottery makers in the west coast of Florida. Our family has a collection of thier works. They are very nice people and unfortunately we have not heard from them in years. Cooncidently, this morning one of thier plates broke. We use their plates as daily wear. They moved to England as his dad was ill last time we spoke. If you find out where they are please advise us. We have been trying to connect with them for years. Thank you. William and Vicky were true hippies. The sweetest and kindest of people. I had purchased one of their trademark owl coffe cups and I droppped and broke it,. So I contacted them to replace the mug. The sent it to me and said it was a gift. Who does that? We began collecting this pottery more than 40 years ago. William & Vicky lived in South Florida and did the arts festivals circuit every year. They stopped as Williams dad got sick and I believe they returned to the U.K. Me and my family had collected several pieces from egg holders to serving and place settings and use it daily!